Lop Ears: The ear looks prominent in this case as the central depression is too deep. Scroll Ears: This is a congenital defect when the outer edge of the ear curls inwards or outwards. Microtia: A medical condition where a person is born with severe underdevelopment or absence of external ear. Cauliflower Ears: Ear protrusion is caused due to repeated injury or trauma to the area in this case. Cagot Ears: People born without earlobes are said to have Cagot ears. Cleft Earlobe: Otoplasty can correct a cleft or notch in the ear lobe. Prominent Ears Reconstruction – Why Do People Do It? Most medical conditions described above cause more social and mental distress rather than physical distress. People with prominent ears are often subjected to social ridicule as well as teasing. This can cause self-esteem problems and in such cases, an Otoplasty will definitely help in improving their quality of life. While there are plenty of adults who undergo ear pinning operations, it is performed more often on young children. The most common age group for otoplasty is children between five and ten years. The ears reach their full maturity by the time a child is four years old. If the ear protrusion is causing the child distress, then an Otoplasty will definitely be beneficial. The surgery is easier to perform on children as the ear cartilage is soft and malleable. In adults, the development of nerve endings in the auricle might cause more pain post-surgery. The ear can get damaged due to repeated trauma. For example, several boxers suffer from cauliflower ears due to the nature of their sport. In such cases, an Otoplasty can help rectify the damage. What Can Be Achieved Through Correcting Prominent Ears? Although patients who expect to gain a pair of perfectly symmetrical ears will be disappointed and the improvement might seem insignificant immediately after the surgery, the procedure will be cosmetically beneficial in the long run. The patient will experience swelling and bruising in the site for a few days, but once the healing process is complete, the difference in ear structure will be starkly noticeable and positive. 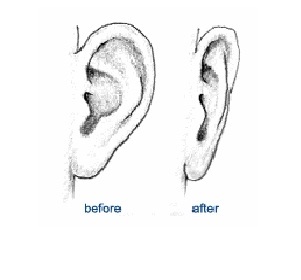 Patients need to remember that, even in normal cases, a pair of perfectly symmetrical ears can be a rarity. It is extremely important to have realistic expectations about the result of the surgery and to take the necessary measures before and after otoplasty as per the recommendation of the surgeon. The ear surgery recovery period is around six weeks. For those who are extremely disappointed with the result of the surgery, a re-operation is possible. But it should be timed at least six months after the first operation. The re-operation, which can be done from the same incision, comes with increased risks although prominent ears can still be rectified. This entry was posted in Otoplasty and tagged ear pinning, ear protrusion, prominent ears by Zipheal Editorial Staff. Bookmark the permalink.